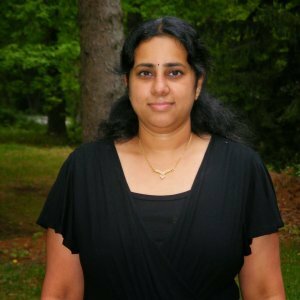 South Vs North challenge was started by Divya Pramil of You too can cook Indian food. This has been a very successful event where South and North team challenge each other with authentic region specific dishes. 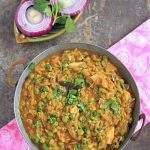 I am from the South team and we were challenged by Sanoli from Sanoli’s Kitchen who is member of the Northern team to make this delicious Bengali dish. Thanks Sanoli to introduce my family to an awesome dish. This dish was thoroughly enjoyed by my family and especially me. I am stating this very specifically because peas is the only vegetable that is not on my favorite list. 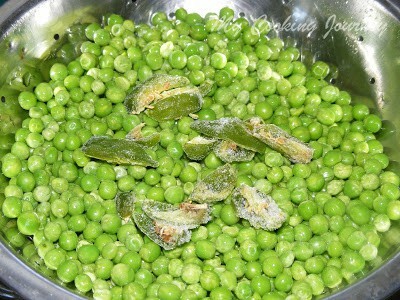 I would not say that I hate green peas, but it is definitely not my favorite. 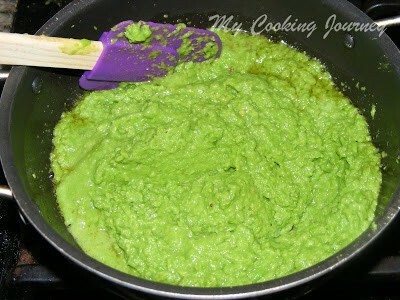 There has been one other dish that I have made which had peas as the star ingredient and it has become my favorite. 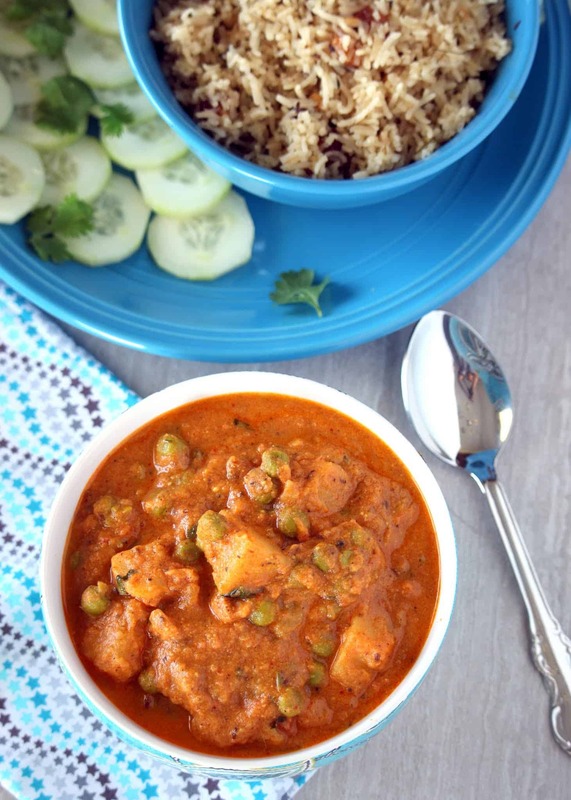 That dish is Kerala style peas Masala. 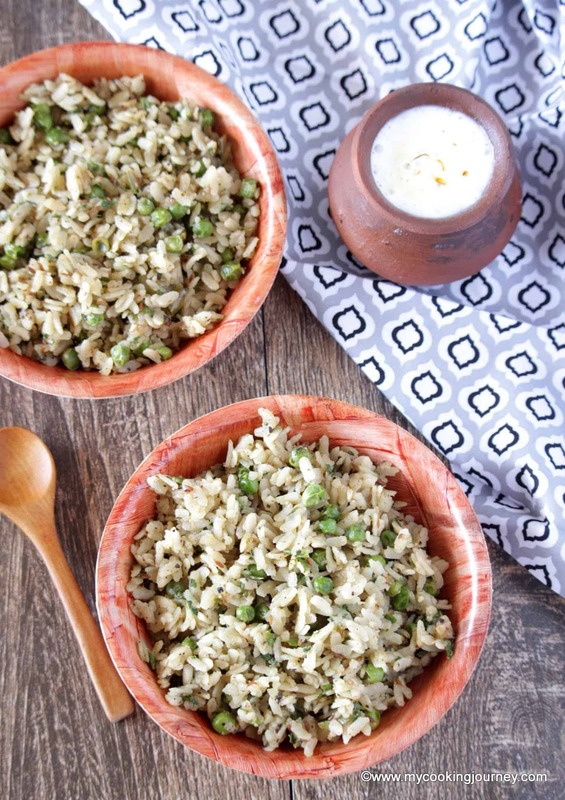 After that this is my second favorite recipe with peas that would become one of the often made dishes in the house. 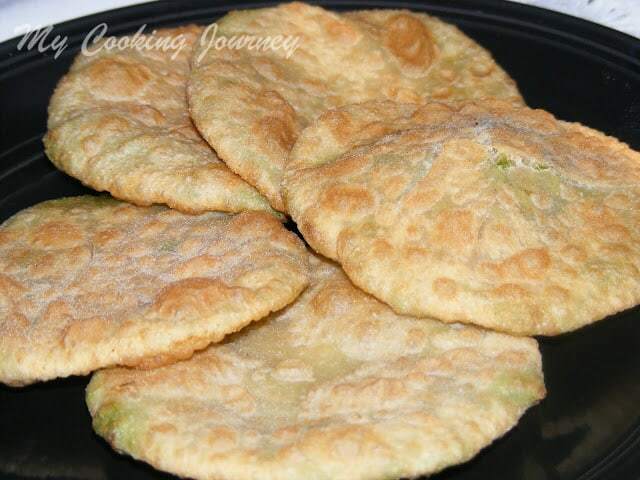 The kachori itself does not really need any side dish to go with it. 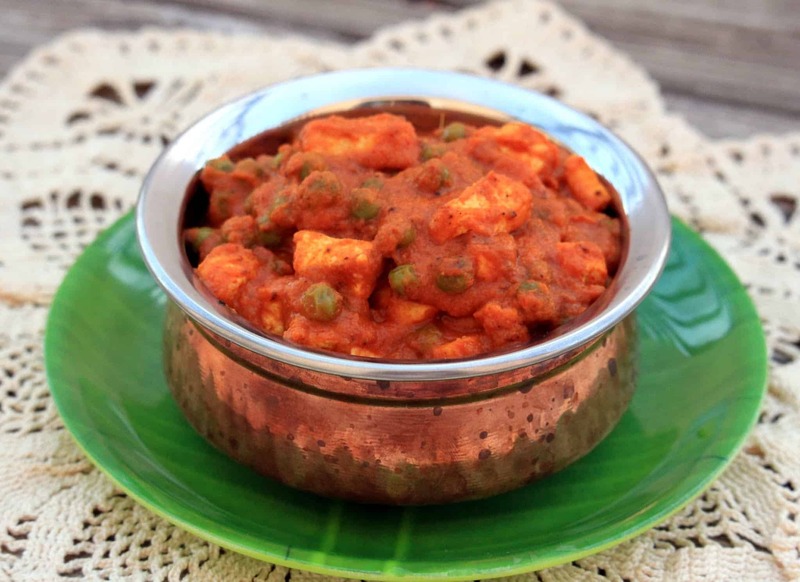 The sweetness of the peas along with the addition of spicy ingredients truly makes this dish stand alone on its own. 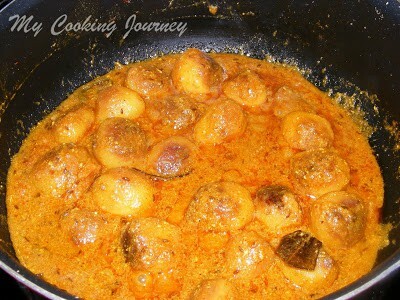 Dum Aloo recipe is slightly tangy gravy that went along really well with the Kachori. This is a No onion, no garlic dish. So anyone looking for dish without onions and garlic, this is for you. 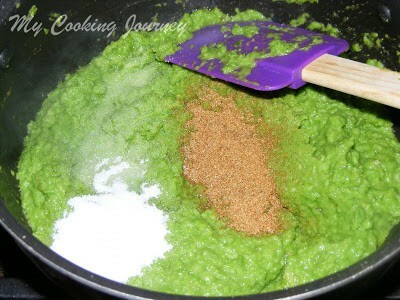 Grind the green peas with the green chilies to a coarse paste. Do not add any water when grinding or add very little water. Please do use fresh or frozen peas to make this. 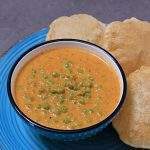 Do not use the dry green peas as the taste would clearly be compromised. 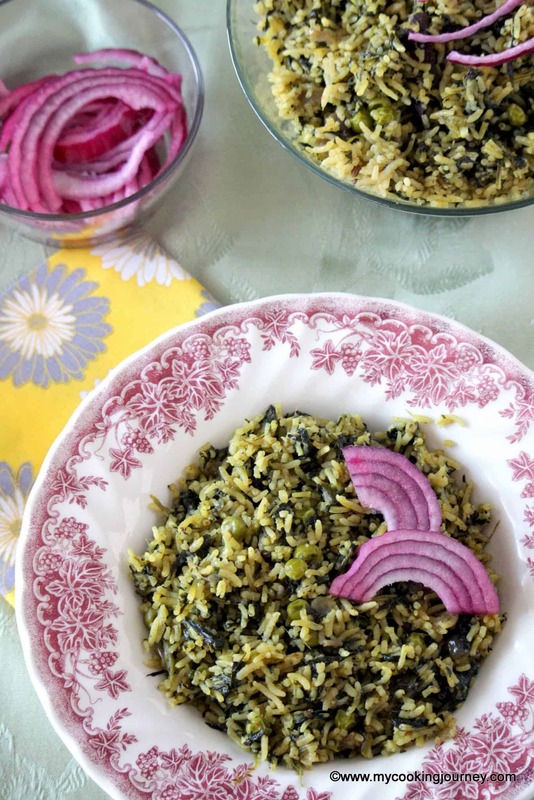 The sweetness that comes from the peas makes a big difference in the recipe. Keep the ground paste aside. 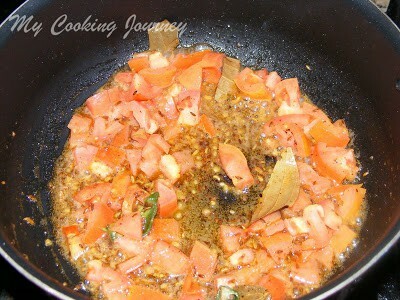 In a pan, heat the ghee or oil and add the asafetida to it. 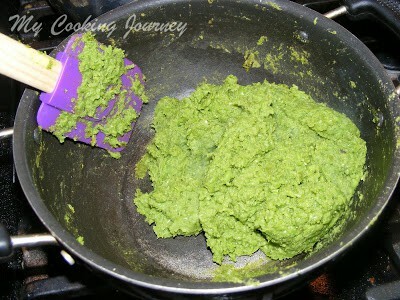 Now add the ground peas and mix well. Add the ginger paste or the grated ginger along with cumin powder, sugar and salt. Mix well. Keep cooking the peas until all the moisture evaporates. 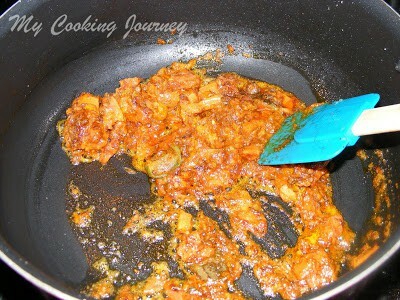 Once the mixture becomes dry, it would sort of appear like halwa and it will start leaving the sides of the pan. Remove it from heat and let it cool down to room temperature. Once cooled make it into small balls (maybe around 18 to 20). 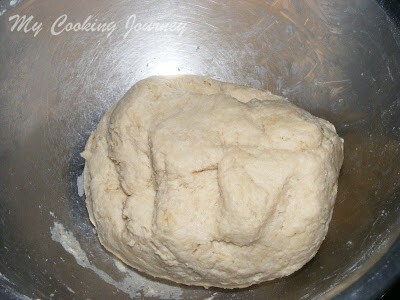 Mix all the flours along with the salt and 1 tbsp oil and adding enough warm water make it into smooth dough. Leave it aside for 15 – 20 mins to rest. 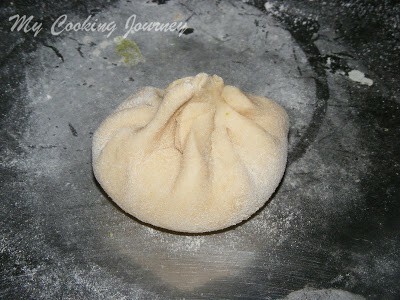 Now make small ball from the dough and roll it into a small circle (about 3 inches in diameter). Now place the green peas ball inside. Now cover the filling with the dough and seal it properly. 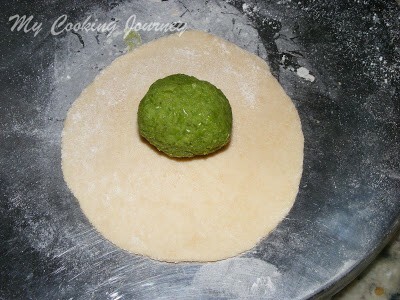 Carefully roll the stuffed ball to a small puri dusting it with wheat flour to avoid sticking. Roll carefully in such a way to prevent the filling from seeping outside. 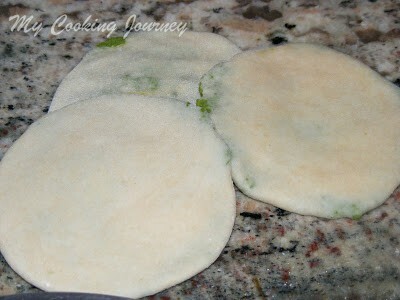 It is possible for the dough to break in few places, but try as much as you can to seal it. Heat oil in a deep pan to deep fry the kachoris. 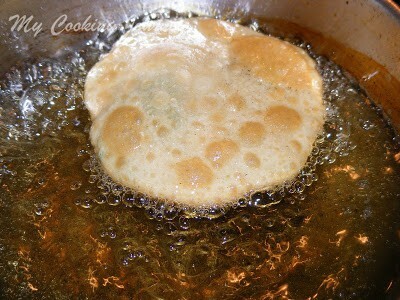 Once the oil has heated, carefully drop the rolled out kachoris in to hot oil and fry on both sides until golden brown. Make sure that the oil is not too hot, otherwise the outer will become dark very soon and the inside would still be very doughy. Drain on a paper towel. Repeat the same with the rest of the kachoris. 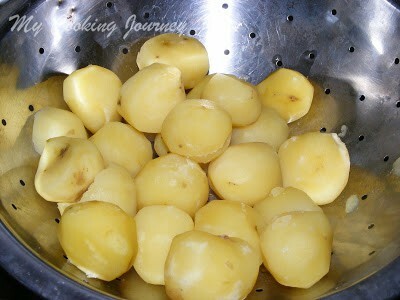 Wash the baby potatoes and peel them. 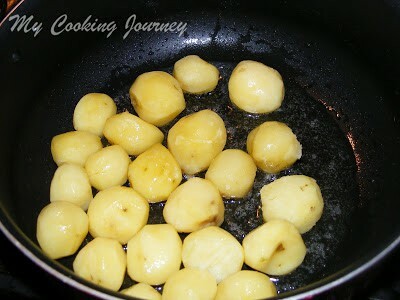 Now boil the potatoes in water until they are fork tender. 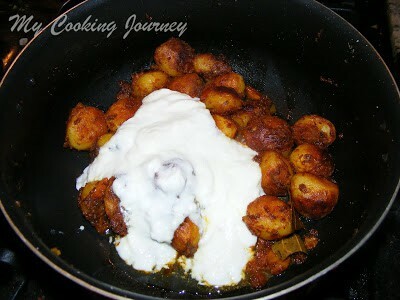 Also add little salt when cooking the potatoes to ensure the salt absorption by the potatoes. Take care not to overcook the potatoes. Drain and keep aside. In a wide pan, heat about 2 tbsp of oil and add the cooked potatoes. Shallow fry them until they are golden brown. Drain the potatoes and keep aside in a bowl. Sorry, I forgot to click the picture of nicely roasted potatoes. In the same pan, add the remaining oil. 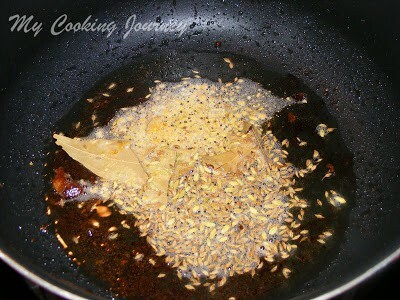 Add the asafetida, bay leaf, cumin seeds and fennel seeds. Fry for minute until the spices are fragrant. Add the chopped tomatoes and green chilies. Mix well and add all the dry spice powders (turmeric powder, cumin powder, coriander powder, and garam masala), salt, sugar and ginger. Fry well until all the spices are well mixed and the oil floats on the top. Now add the fried baby potatoes and mix well. Cook for about 2-3 minutes. Then add the sour curd/yogurt and mix well. Also add about half a cup of water to dilute the gravy. Let the gravy boil for about 8-10 minutes. Add the cilantro and turn off the flame. EXCELLENT. I LOVE IT! I'm trying this on the weekend! WOW …This looks good, Tempting !! 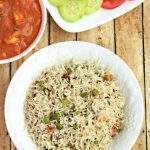 Love this yummy dish always. Hope you enjoyed this dish dear. 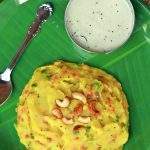 you add atta, rava and gram flour with APF, liked that variation. Well done and well explained recipe dear. 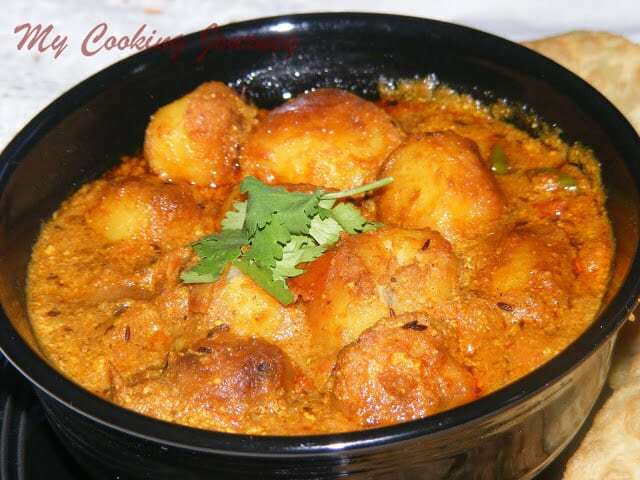 Dum aloo looks so perfect and delicious….mouthwatering here. wow amazing picture and looks tempting..
Looks Yumm and nice clicks too. wow its again drooling me akka… can feel the taste still…. I WILL TRY TODAY GREAT. 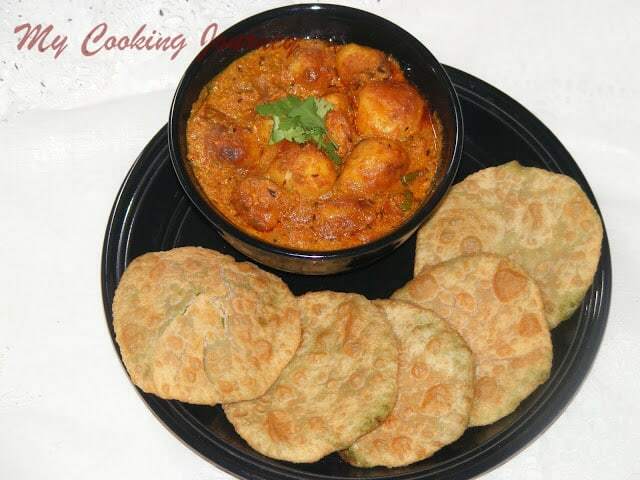 inviting both kachori and aloo. ncely described super clicks. 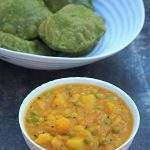 Delicious green peas kachori and spicy dum aloo, you are tempting me to make this. Nice detailed post and with neat explanation. Very well explain. 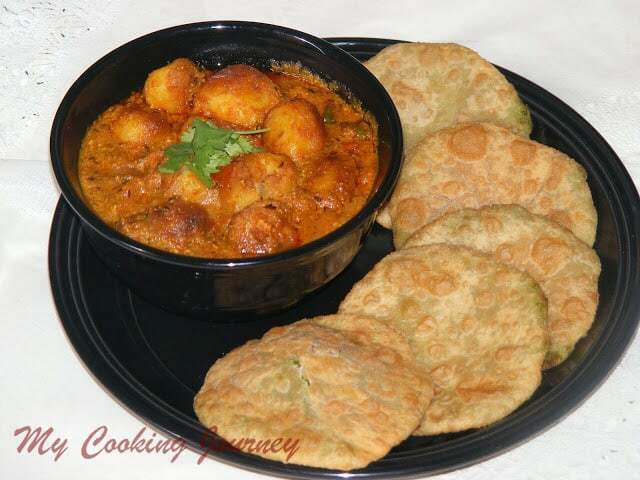 crunchy kachori with spicy dum aloo. Both combination are drooling. 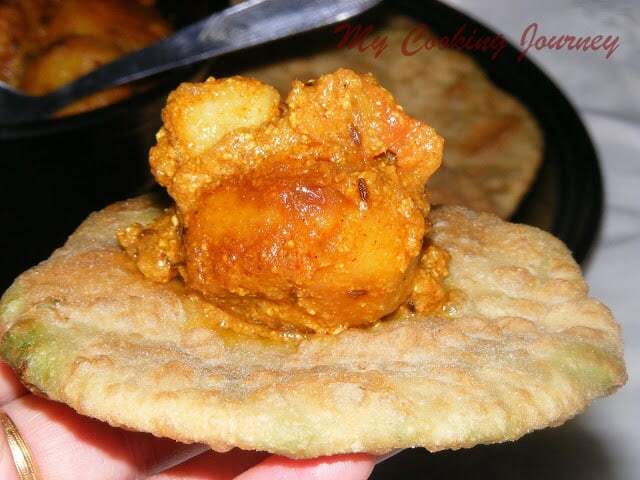 Love your stepwise pictures and well explained post, who can resist to this delicious kachori and dum aloo, a killer combo. 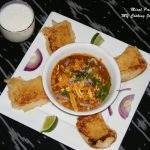 Wow Sandhya.. You have made it very well.. Looks so yummy!! 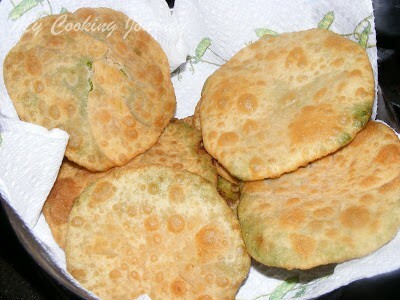 So good sandhya u have made the puri puff well. beautiful combo right love your click.